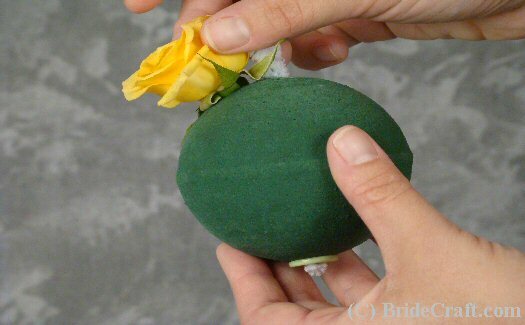 Create a Cinderella Ball for Your Flower Girl. 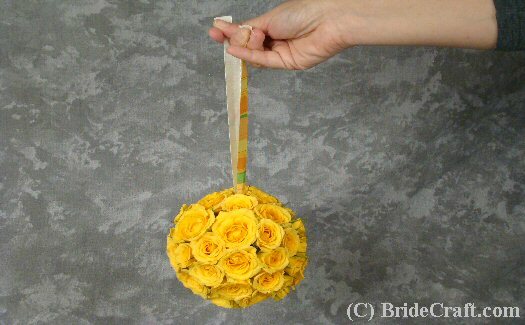 Do you love the idea of your flower girl carrying a n incredible sphere of flowers down the aisle? 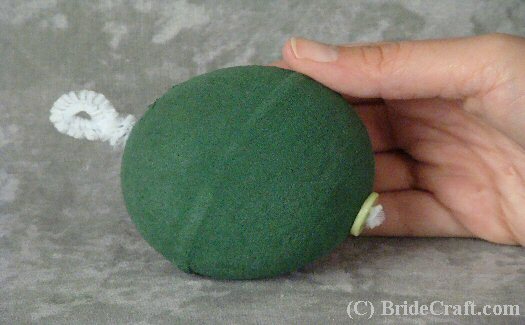 Want to know How to Make a Cinderella Ball (aka, kissing ball and pomander ball) just like this one? Below you will find a step by step tutorial showing you how to do just that. Pros: These look incredible! 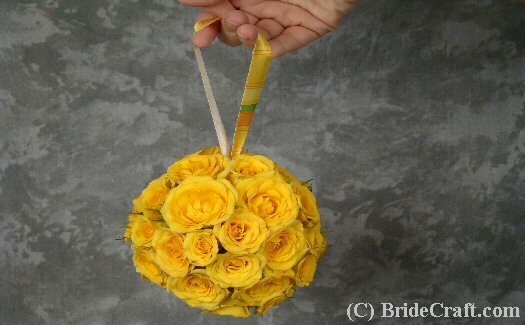 If you have a shy flower girl who may not toss petals or a venue that won‘t allow petals, this is a good alternative. Medium difficulty to create for maximum effect. 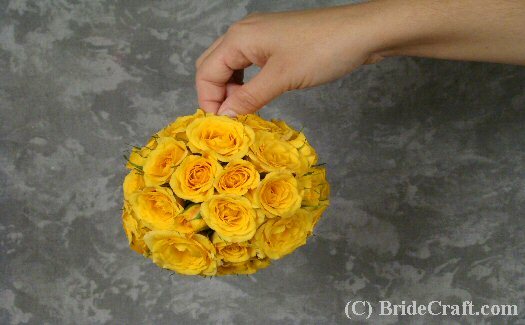 These are also beautiful for bridesmaids to carry, and to decorate the with. Cons: It’s a bit tricky to determine how many flowers you need. It’s easy to get too few, as the round shape tends to trick the eye. And like all fresh flower projects, this Cinderella Ball must be done pretty close to the wedding date, possibly the day before. And definitely use the spray adhesive with this project, or disaster could occur. 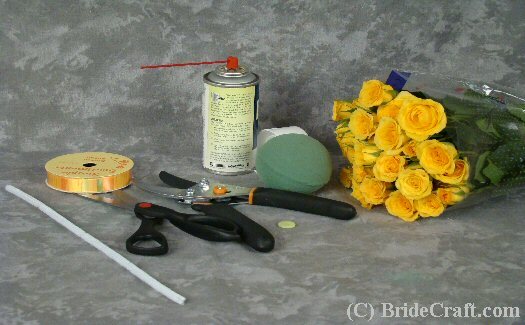 Step 1: You will need a 4” Oasis foam sphere, 10 to 15 stems of open spray roses, , flora lock spray adhesive, 1 piece of chenille or fuzzy craft wire, 1 medium to large button, ribbon, scissors and floral or garden clippers. 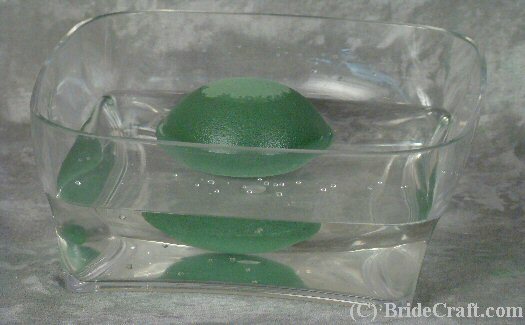 Step 2: Soak your Oasis sphere in clean, cool water. Tip: Do NOT push the sphere into the water to soak it quicker. This creates air pockets. Simply set the sphere on top of the water and let it soak it up at its own rate to ensure that it’s completely saturated. 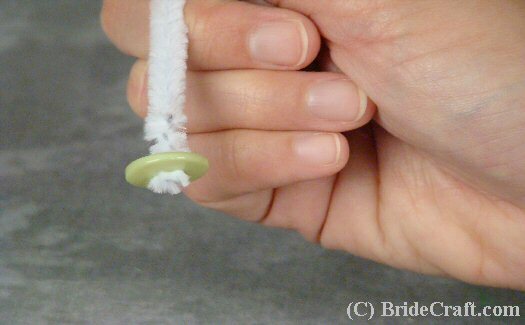 Step 3: Wire the chenille (fuzzy wire) through the button and twist ‘til it’s secure. Step 4: Push the wire through the Oasis sphere in a straight line. Pull until the button is flush with the “bottom” of the sphere. Step 5: Twist the extra wire into a loop and twist it around to secure it. Trim any excess. 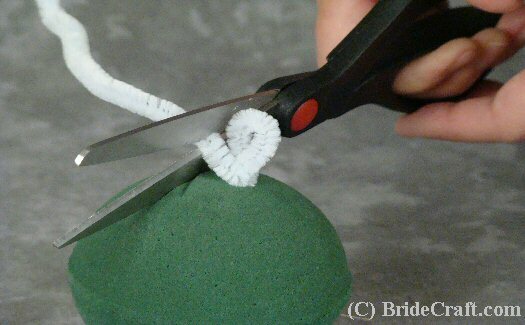 Tip: For those of you who hold your scissors sacred, I would suggest using the clippers or wire cutters for cutting the wire. Step 6: You should have something that looks like this now. 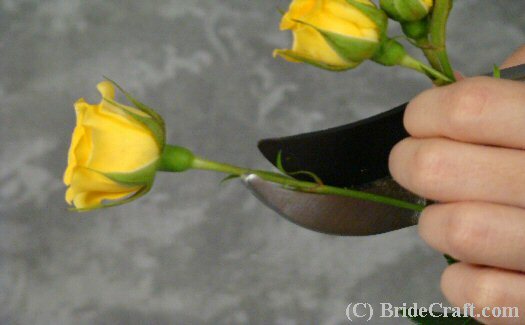 Step 7: Trim your spray rose heads. Tip: Keep the stems a bit longer. A stem that’s too short won’t be secure or long enough to let the flower continue to drink. Remember, you can always trim it shorter if it’s too long…you can never make it longer again. Step 8: Cut enough heads to start your project. Tip: Keep the cut rose heads in a shallow bowl of water. 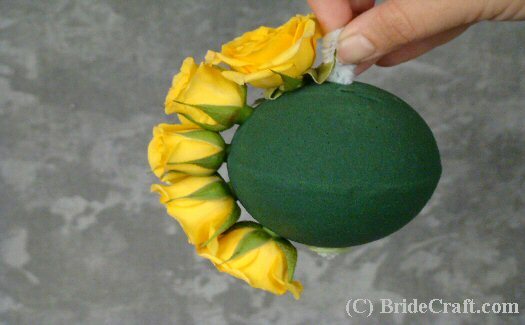 Step 9: Choose a place near the top of the sphere and firmly but gently press in a stem of spray rose. 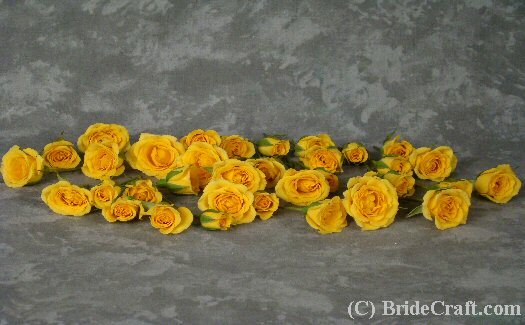 Step 10: Proceed to create a line of spray roses. 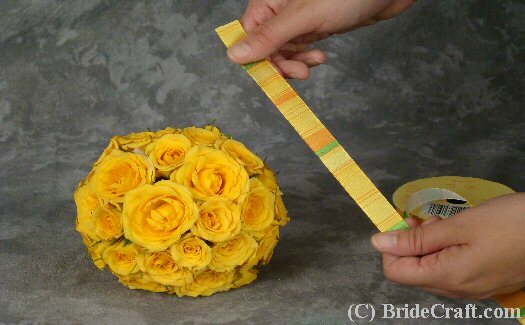 Once the sphere is divided into two halves by the line of roses, fill in each side. Step 11: You should have something like this. 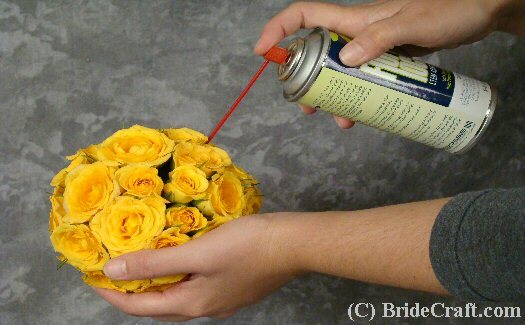 Step 12: Apply the spray adhesive onto the foam between the roses. Apply in several areas for best results. Tip: The Oasis spheres dry out pretty quick. This tends to let the flowers fall out. Disaster! This gentle floral spray glue helps to secure them against this. Make sure not to jab the spray straw into the foam, but lightly spray the foam itself. 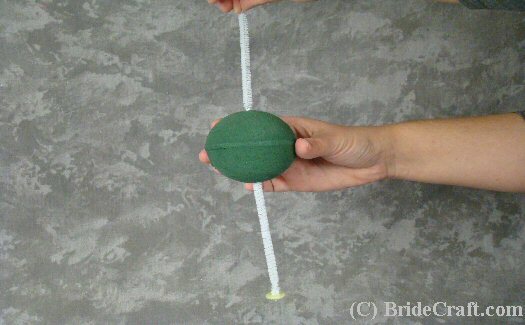 Step 13: Measure the amount of ribbon you will need to create the handle. Cut the correct length. Step 14: Test for security. Proceed to tie the ribbon into a knot. 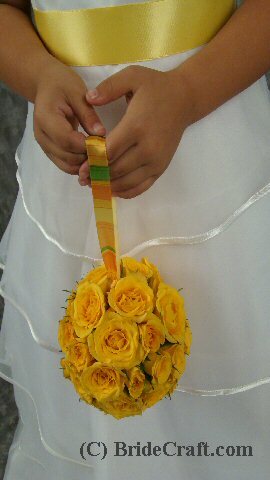 Spin the ribbon so that the knot is at the bottom, tucked under the roses. Step 15:Your Cinderella Ball is all done! Store by hanging in a cool place. Tip: The spray roses can be stored in the fridge, tied to a wire shelf.